Happy Sunday guys, did you get up to any Halloween fun this weekend? I've been on the sofa watching Stranger Things, which is my books is a great night in :) Who doesn't love Autumn right? Even though it's now dark at 5 *cries* I love this season for all the cosy vibes, getting our flat nice and warm and also updating my wardrobe with knits and coats again. The frill bardot design is cute and girly and I can't get enough of the colour. It would great with paired with black, grey or denim and I like how you can change how you style this jumper. You can pull the sleeves down for a full bardot look or if you're a bit chilly, have them all the way up to keep your shoulders warm - win. 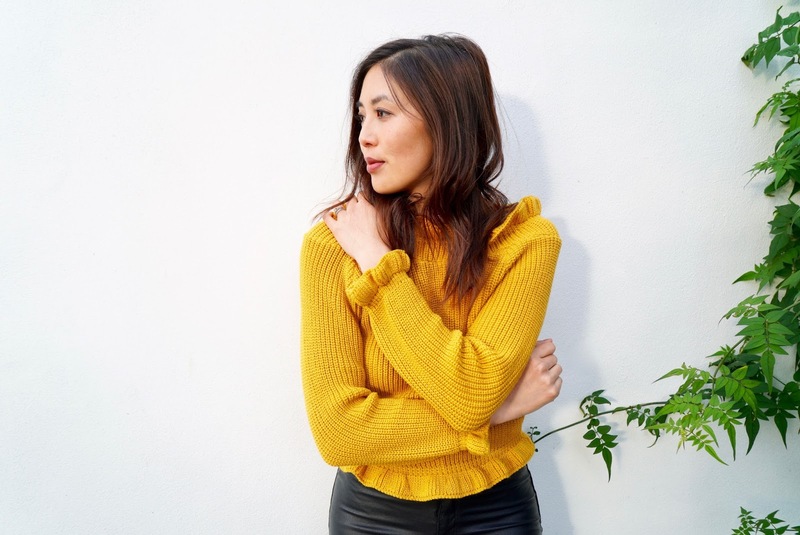 The jumper also comes in a few other colours, I really want to get the khaki one and for £16 it's such a bargain, it doesn't feel itchy against your skin and feels pretty cosy. Do you like the mustard colour? I think it's such a fun colour to update your look and screams Autumn. 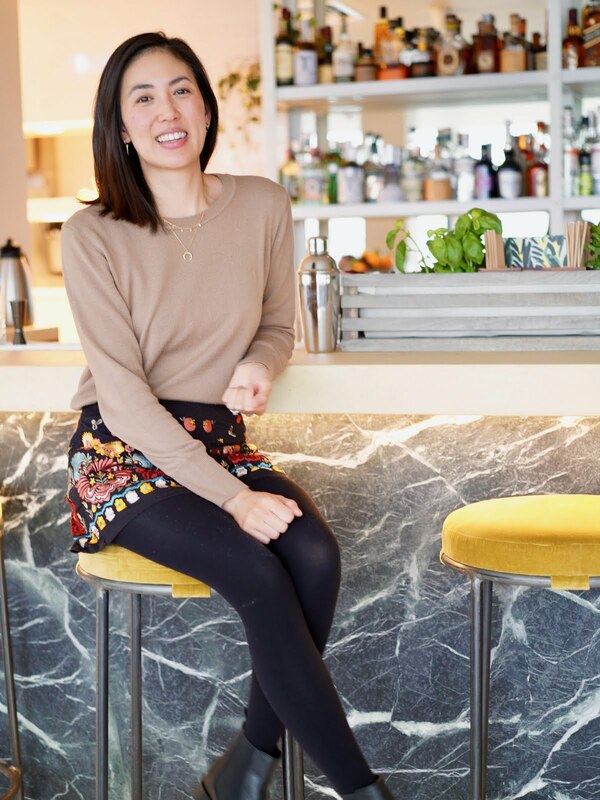 I've been trying to wear denim less and wear more trousers, even though it sounds smart I really like how trousers add an effortless vibe to your outfit. My favourite style of trousers is tapered legs and these paper bag black trousers* are ideal for any outfit. The paper bag name is funny right but I guess that's the ruched detail around the waist. These style of trousers makes any outfit look cool, even if you wear them with the scruffiest trainers! They are quite high waisted and with the ruffles and belt, it's a bit busy so it looks best with a crop top or fitted top. I also love these style of trousers with heels for a night out, if like me you don't like wearing tights and skirts all the time! The material is not bad, I thought it would be uncomfortable and stiff but they're nice and easy to wear. 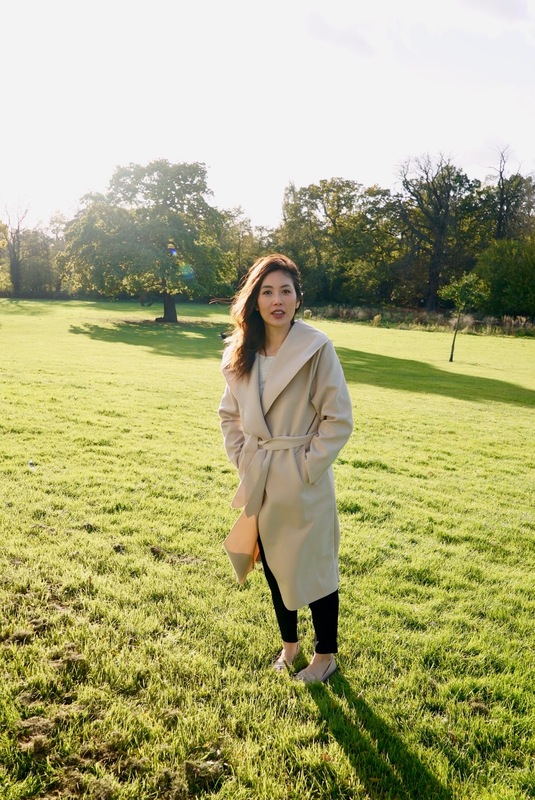 The best way to update your Autumn wardrobe is with a new coat, am I right girls? It's getting cold and the first thing anyone sees of your outer-ware. I have a few coats and jackets but not a waterfall style one, this stone coloured coat* is my new favourite. At first I thought the colour was too light and not easy to wear but the stone colour looks really chic and sophisticated and a nice break from black and grey. It's great for days that's not so cold but you still want to throw one something to keep you covered up. 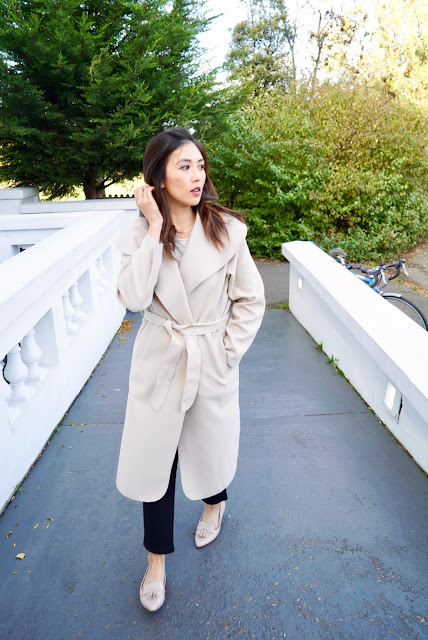 I was out for a nice dinner the other night and this coat went perfectly with my outfit, it gives it a nice dressy vibe without wearing a bulky and thick Winter coat. 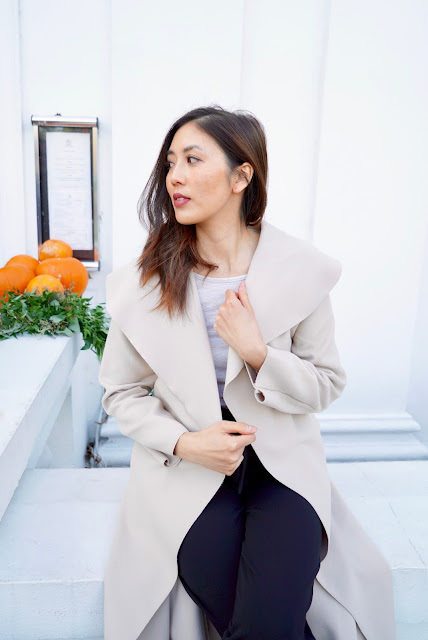 I like the large lapels and the wrap belt, it's so easy to throw on and looks good dressed up or down, I like wearing a fancy coat with someone really casual like jeans and trainers. The quality of the coat is not the best and feels super thin, this will not keep me warm on a cold night (!) but for a statement piece for £18 it's not bad at all. You can check out the other waterfall coats here. I hope you enjoyed this style post, it's been a while since I roped Hang to take some photos and it felt good to get back on the blog again, even though I kinda forgot how to pose hehe. The weather was gorgeous today so bright and fresh, I'm really happy with how the photos turned out, thanks again hubs! How's your weekend been? Any fun plans for the week a head?